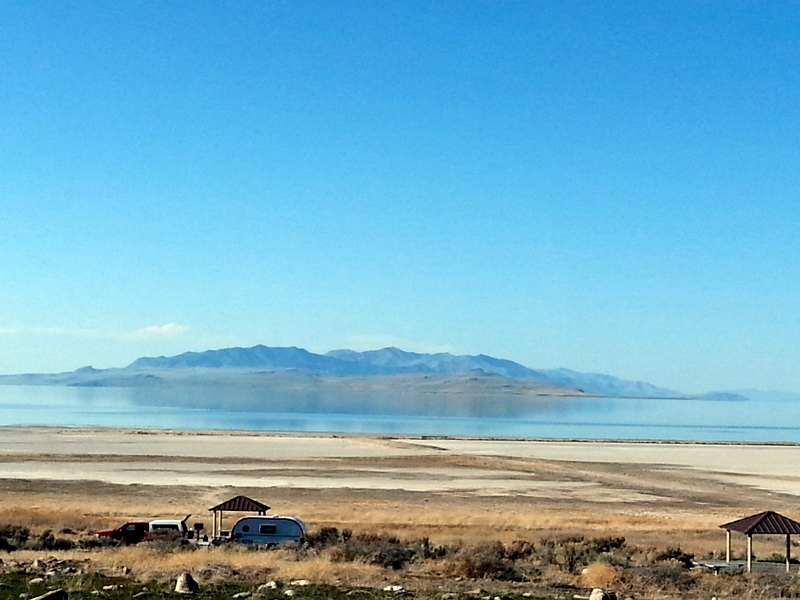 On a tip from our camping friends, the Blakes, we head to Antelope Island State Park, an island stuck out in the middle of Great Salt Lake. Knowing that we like rustic camping, Caroline assured me that this campground would be right up our alley. Score! The Ranger at the check-in station said she assigned us to one of her favorite sites. Lucky for us, she was either captivated by Jezzy hanging out the window, or the Fireball. Either way, we got the best location – right on the shore. These spacious campsites have covered picnic tables, cement slabs, and in-ground firepits. They could not have been cleaner. Clean pit toilets, and water available at the dumpstation just two miles down the road are all we need. What’s great about this place? Wildlife abounds. We had a coyote stalking the jackrabbits that are everywhere in sight (Jezzy went nuts! ), and birds abound. Saw my first antelope ever, then saw another half-dozen just to make sure it wasn’t a fluke. But, the real prize are the 700 bison on the island. A big bull decided to hang out alarmingly close to the Fireball. After wandering around the campground, he decided that a large rock about 15 yards from the our site was his scratching post. 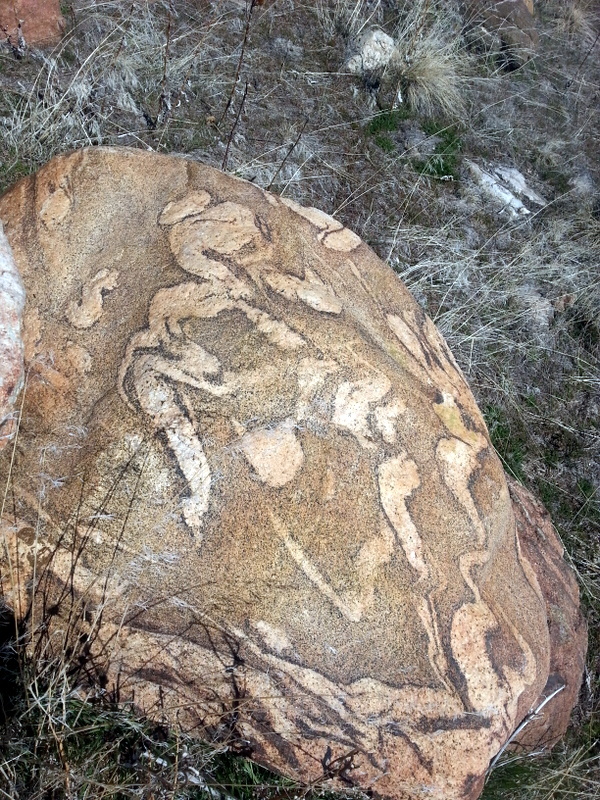 Watching him leave huge hunks of loose hair on this rock was unbelievable. 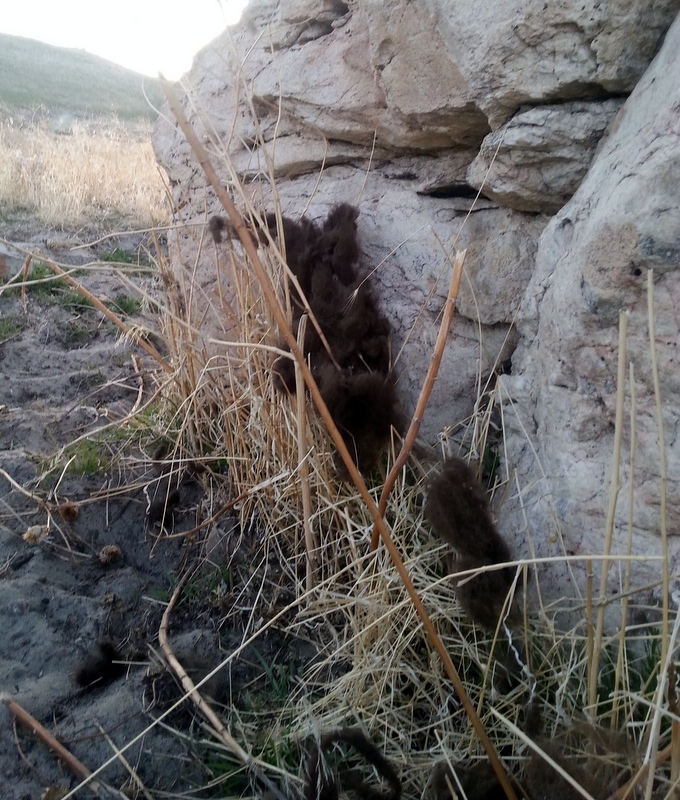 Big clumps of bison fur on the rock after he departed. We hiked up Sentry Mountain, which promised a good view of the west side of the Island and Salt Lake. We weren’t disappointed in the hike or the views. I really wanted this boulder for my yard at home! While not technically challenging, it did have us huffing & puffing. By the time we hit the top, we were more than ready to enjoy lunch. 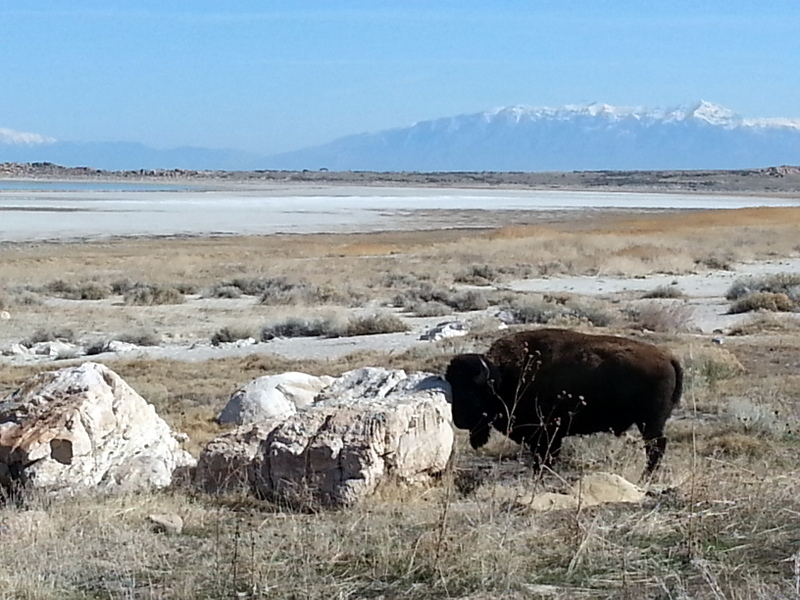 But, the most unusual thing that happened to us on Antelope Island? As we were hanging around in the morning drinking coffee outside ( in our fleecy pants that we wear in the morning and at night, looking pretty much like derelicts), we were approached by two women who strolled into our campsite. Would we permit them to use the Fireball as a backdrop in a catalog photoshoot they’re doing? Sure, we say, jumping at the chance for fame and fortune. Soon, we are swarmed with five people – a project manager, stylist, photographer, art director, and a gaffer. The funniest thing about this is that these folks are shooting a catalog for Deseret Press, the publishing house of the Mormon Church. After all my years in the bookstore business, this may be my claim to fame. They bring out several of their titles, and are stacking them on vintage suitcases in front of the Fireball. They like the look of our red campstove, so that gets moved into a shot, along with our prep table (which we have used maybe once in our lives!). It’s at this time that the aforementioned bull bison comes around again. Out comes the BIG lens – a 600mm Canon lens. All attention is averted from the product shot, and we’re all taking photos of the bison. It’s pretty comical. 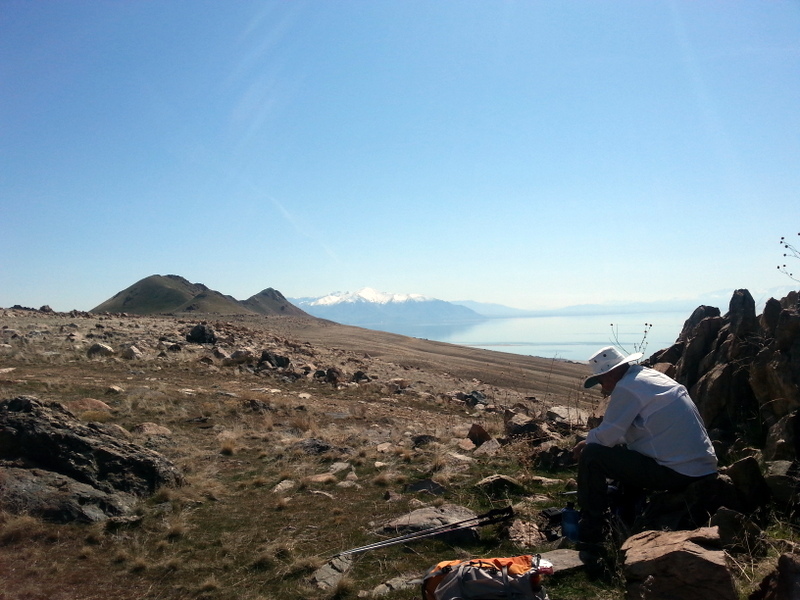 All in all, we spent two perfect days on Antelope Island. Remote, yet close – primitive, but almost downtown. Doesn’t get much better than this. This entry was posted in books, camping, great outdoors, hiking, retirement, RV life, simple camping, state parks, T@DA and tagged camping, retirement, RV life, simple camping, state parks, T@DA, the great outdoors, Utah by Judy Crankshaw. Bookmark the permalink. 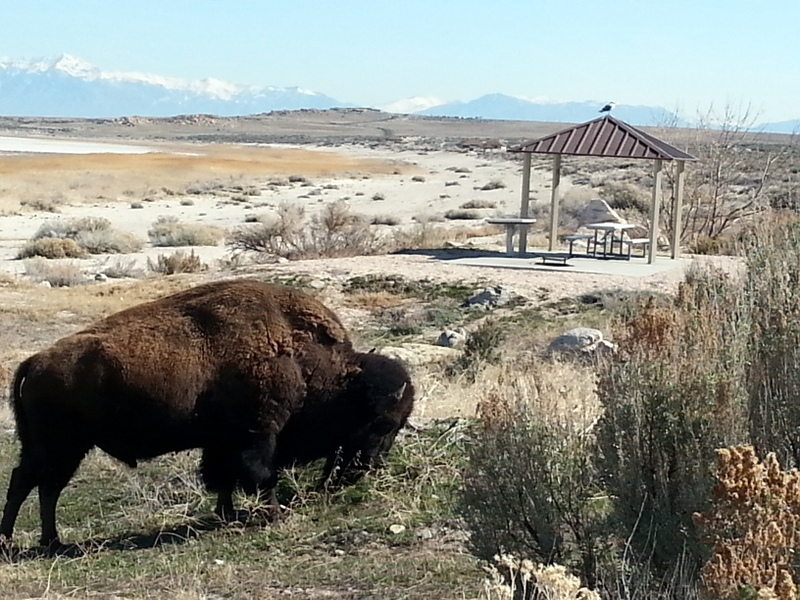 Only you…..I bet that bison felt pretty free to rid himself of some that winter coat! You travel the coolest places! We try to keep our eyes and ears open for offbeat places. Seems like we’ve found a few good ones. That looks like my kind of place! Not too many people, but lots of critters, I think that I would have stayed a few more days. We have over scheduled ourselves. Have some reservations plotted out, so we have to move on. We would happily have stayed a week to explore. Gee, Sandi. I can probably get you on the LDS mailing list and you can get your own catalog. In anyway, you’ll definitely see it. 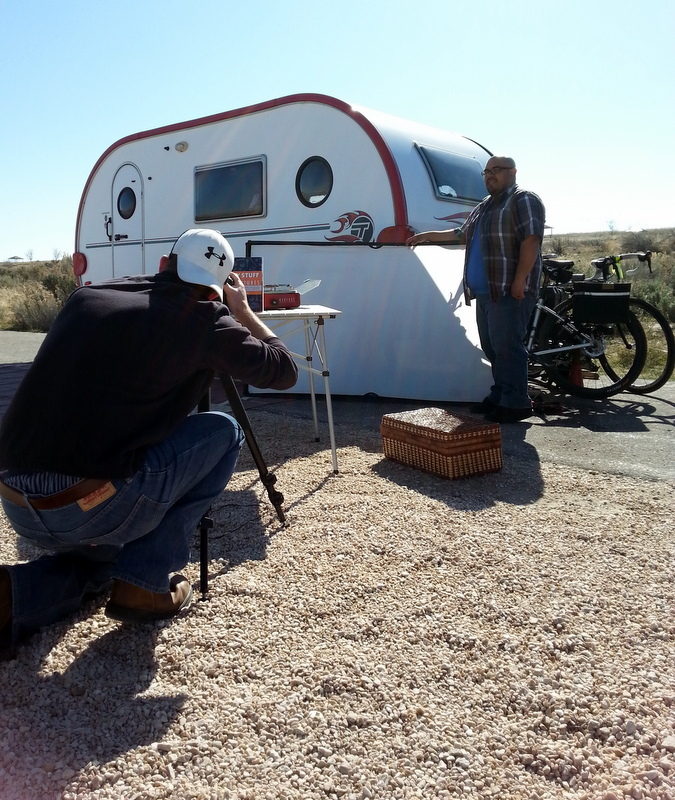 Are you in full Airstream mode now? Met a guy yesterday with a gorgeous 22 ft Bambi…..
How did you get to the island? That’s a kind of scary to be that close to a bull bison. Amazing! There’s a long causeway that ends at the park gate. The $2 fee is included in the camping/park fee. You have some of the greatest experiences! We are lucky. It’s been a great trip, and we’ve found some unusual spots.